If you’re looking to unleash your creativity, or just trying to find an idea for your kid’s school project, take a look at our list of the 10 easiest musical instruments to make at home. Whether you want to spend some quality time with your little ones on a fun DIY project, or you would just like to be creative while you are having a vacation, making musical instruments can actually be very rewarding. There are tons of unique homemade instruments that you can try out, like the Popsicle Stick Kalimba and a guitar made out of cardboard boxes, or PVC Pipe Flutes. You can even craft homemade instruments with different pitches like making a homemade pan flute by cutting straws at different lengths. Or you can even go and craft something professional looking and something worthy of being in an actual orchestra, but that will require a lot of tools and machining skills, therefore, we will not be talking about those in this article. Will be talking about musical instruments that are easy to make, and those that are made from recycled materials. If you looking for instructions on how to make musical instruments with recycled materials, then this article will certainly help you because we all need to do our part in helping the environment. Once you finish reading, you’ll be prepared to craft homemade wind and string instruments, like the cardboard guitar we previously mentioned or a disposable glove bagpipe, from stuff just lying around your house. We will also be covering how to make a homemade harmonica out of popsicle sticks and rubber bands in minutes. 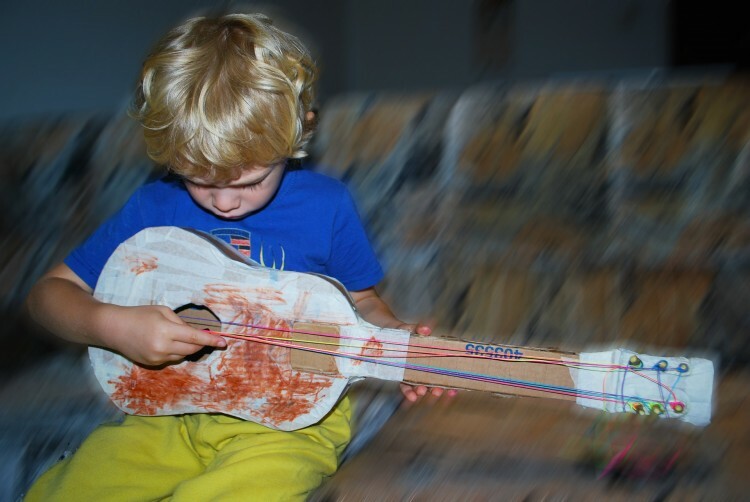 The easiest to make musical instruments at home, may not be the best substitute for the real thing, but they are certainly things you will enjoy making with your kids. Even if you have never taken on such a project, you will be able to craft some amazing looking and also functional musical instruments that are truly unique. The best part is, your kids will enjoy making these with you, and also enjoy playing their first melodies on them as well. Undertaking a DIY project is a fun way to spend a rainy day with your kids, and if you are looking for a fun and creative DIY idea, you just cannot go wrong with musical instruments. The skill to play musical instruments goes a long way, so if you help your kids develop musical skills early on, they will have no problem playing the 7 Hardest Instruments to Learn to Play in a Marching Band if they choose to do so later in life. In order to come up with this awesome list, we sought help from a lot of websites that specialize in DIY musical instruments. We filtered out the easiest instruments to make, and then put them on a list to share with our readers. The websites we consulted for this list are, Redtri, How Wee Learn, and play Sing Laugh. We also employed the help of Google’s search engine for the purposes of making this list. We ranked the list based on the number of items needed to make each instrument, the fewer items each instrument needs, the higher it has been placed on the list. Without further ado, let’s get our list of 10 easiest musical instruments to make at home started.